But wouldn’t it be nice if I were one? Imagine: lifetime supply of kiwi fruits and constipation will never ever ever ever (channeling Taylor Swift here) be a problem again. Actually my problem now is just the opposite. After having 2 Kiwifruits daily for a few days, I had to plan my outings so I would be nice and close to a bathroom whenever I need it. (Too much info? I think not). I think one a day is probably quite enough for me. My immune system definitely got a boosting too in these 2 weeks, as I just went through one of my most stressful week this year and still feeling pretty good today. While the other half is sick as a dog (he doesn’t like kiwis… too bad) and has to resort to extra Vitamin supplements. Remember, 1 Kiwifruit contains equal amount of Vit C in 2 oranges and 5 times as much nutrients as an apple. Not to mention the weight loss properties of actinidin and high amount of dietary fibre. I haven’t lost much weight though due to overeating in Singapore. Last but not least, my skin looks more hydrated and radiant. So in conclusion, this is one power food! I had wanted to do more, however my schedule didn’t allow me to. When I didn’t have time to cook, I just ate the fruits straight with a spoon. 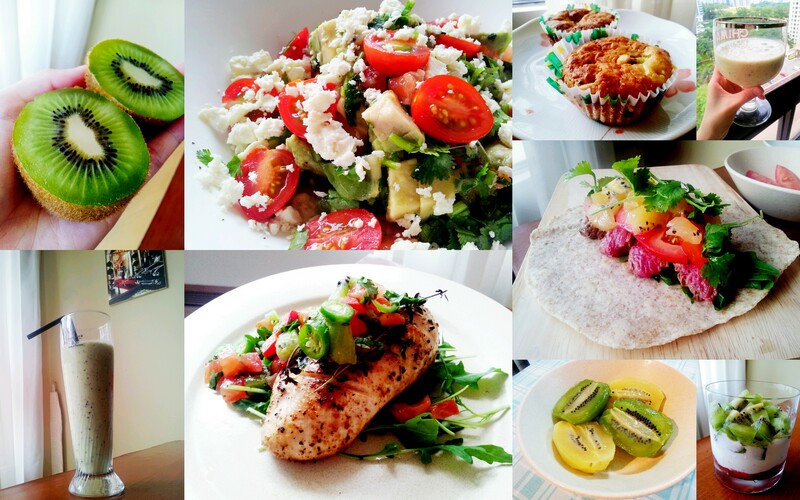 If you are interested in any of the recipes, click here. So before the challenge officially draws to a close, I shall post my final kiwi recipe. Did you know that Kiwis can be used to tenderise meat? 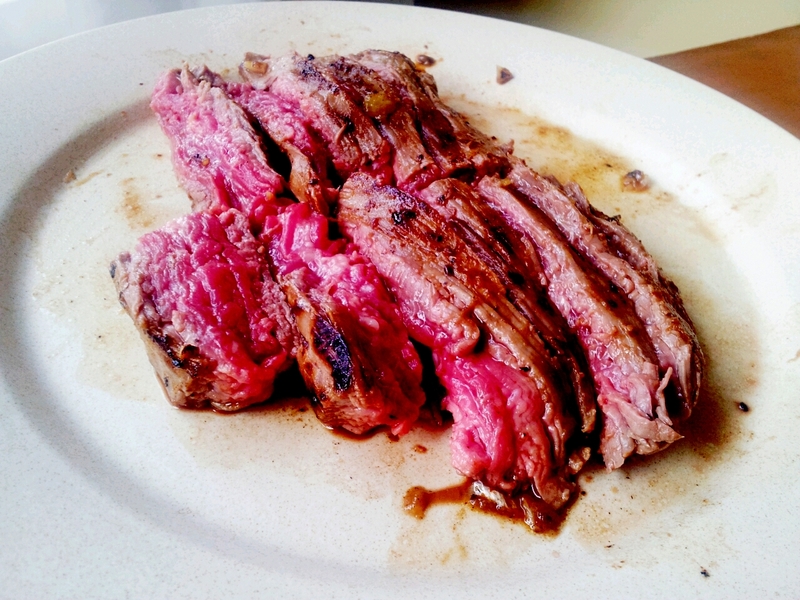 I put this to the test and marinated a flank steak the other day. 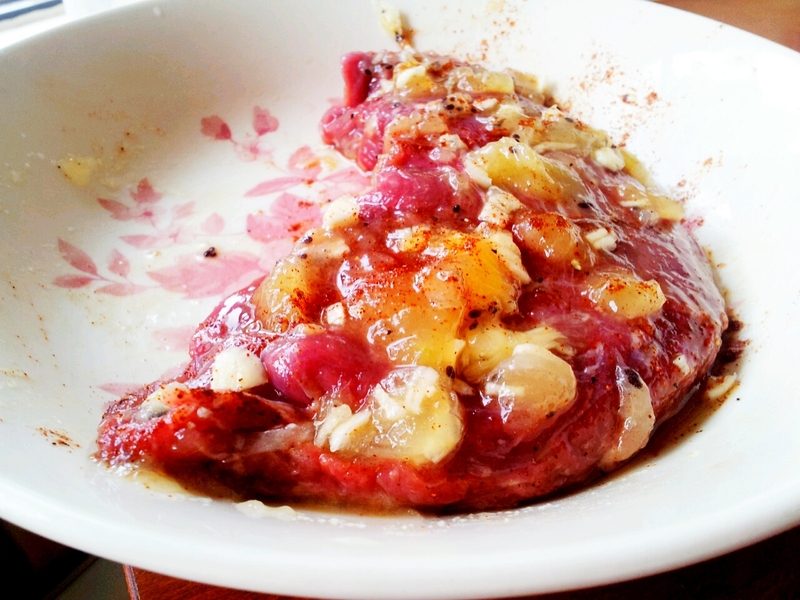 You can do either mash the fruit all up and rub all over, or just use the sliced pieces. I used the Sungold variety (because I finally got some delivered to me!) and you can use Green kiwis too. I think the Sungold does have a more neutral taste though. They both contain actinidin, an enzyme that can break down meat proteins (also present in pineapple, mango and papaya) so you don’t want to marinate it for too long. An hour is ample, 2 is probably too much. For a steak this size, half a fruit is enough. Right, let’s pan fry the steak! I do like my beef kinda still mooing on the table (or as a friend said: still eating the salad on the plate, lol) so I only cook for about 2 minutes each side. Flank steak is generally not very tender, but after some kiwi magic, each bite was lovely and soft, with a little bit of added sweetness from the fruit. Delicious! 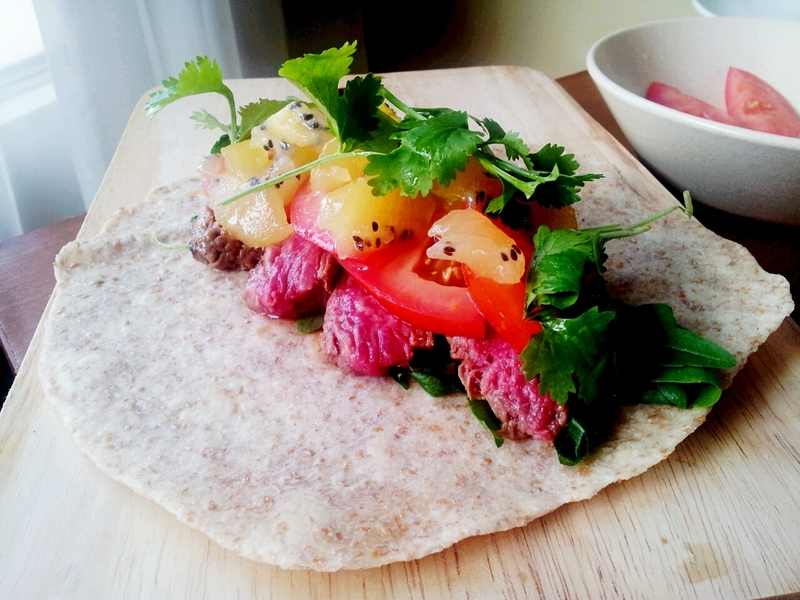 I was looking for a light and healthy recipe, and decided I was going to make some wholemeal flour tortillas to eat with the sliced up steak, and this was the result. Doesn’t it look so pretty? Topping wise, I kept it really simple with some Arugula at the bottom, tomato slices, Sungold Kiwifruit (the other half) and coriander. No dressing needed! So here you go a nutritiously balanced meal with plenty of fibre, lean protein and vitamins. Not to mention quite delightful to eat. If you are feeling a bit naughty, feel free to add some cheese. Cheddar would be lovely. Thank you Zespri Malaysia for such an exciting campaign, it certainly had me sold on the health benefits and taste of the kiwi fruits. I will be putting kiwi fruits on my shopping list now and then. I hope I have convinced you somewhat to maybe give it a try too. If you want to find out more about Zespri Kiwifruits, do check out http://www.zespri.com.my for recipe ideas and nutritional info. 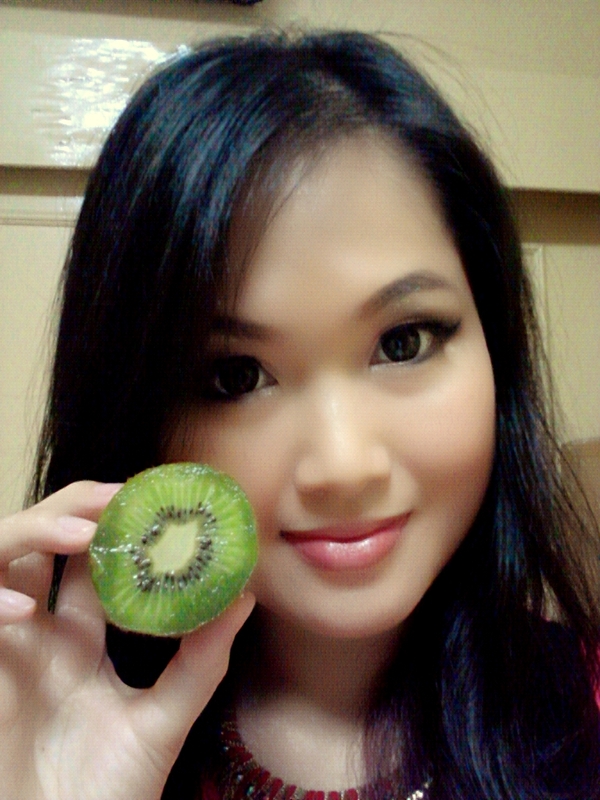 Shall end this post with a vain pic of myself… posing with half a kiwifruit. Enjoy the rest of the weekend. I still have to work tomorrow, though it’s a photoshoot and a meeting about an upcoming dinner party where I’ll be cooking. I love my life! Too bad I cannot eat kiwi… but it was fun following everyone’s post on it. Yah especially those who have been posting everyday! Not really a fan of smoothie either but it’s just another way of enjoying the fruit I guess. That flank steak looks juicy good!!!! Hrmmm I gotta try using thr kiwi As a meat tenderiser one of these days!!! Actually, I feel the gold is too sweet for my taste. I still like the tanginess of the green ones. I guess I just don’t like sweet stuff in general. lol! 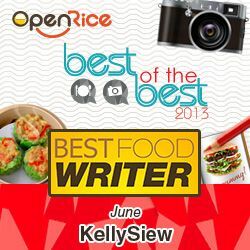 I was going to name my blog Kiwi Siew Cooks. Hmmm.